It's not often a morning train delay announcement provokes smiles. Then again, it's not often that trains stop so someone can give birth surrounded by commuters. That's what happened in Paris on Monday when a woman went into labour on board a busy RER A rail service. A bouncing baby boy was delivered with the help of passengers, emergency workers and rail staff at around 11:40 a.m. while the train was held at the city's Auber Station. 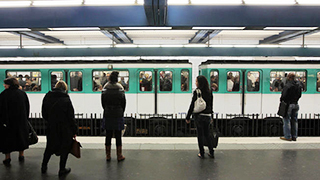 "We can confirm that everything is going well," a spokesperson for French public transport operator Régie Autonome des Transports Parisien (RATP) announced on the network's Twitter feed. Trains were paused in both directions for around 45 minutes during the incident and the carriage was evacuated, although around 15 people were reportedly present for the birth. Commuters were informed of the reason for the delay via a message on station screens which read "unexpected birth of a baby at Auber station," prompting many smiling faces. As excuses go, it definitely beats signal failure.